A truck driver convoy in Australia recently made its way to Canberra to demand new elections. Hundreds of truck drivers converged on the Parliament House to blast their horns, and they were accompanied by camper vans and SUVs decorated with banners condemning the government. Police reported that there were over 300 vehicles in total, which formed into three separate convoys that circled the national capital and snaked past the official residence of Prime Minister Julia Gillard. Hundreds of protestors gathered on the front lawn of the Parliament with signs calling for new elections as well. They want to see an end to the Gillard government plan to slap a carbon tax on major polluters. 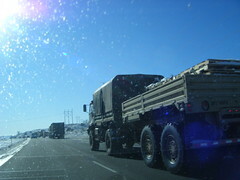 Some of the trucks in the convoy had traveled for over 3,500 miles to reach the capital for the protest.